At 11 a.m. in Copacabana, Argentina was a champion. Its cars, jammed with pillows, sheets, singers, and drinkers, lined Avenida Atlântica. Everywhere you looked it was blue and white. The Brazilian hosts, apparently smarting from another defeat the night before, were nowhere to be seen. They may have all been at the Flamengo club store. As the reality of what had been witnessed Tuesday night sank in locally, and the nightmare of an Argentine win in the Maracanã moved a step closer, a certain wry fatalism overtook some of the Brazilian fans. They began buying up Flamengo jerseys en masse. The red and black horizontal stripes of the local team are also the colors Germany wore in its historic thrashing of Brazil. A better mind than mine can unpick all the sublimated forces at play in that little bit of visual riffing, but what became clear, the closer I got to the Maracanã — and the more the massed ranks of Argentina fans were diluted by yellow as well as red-and-black shirts — was that while there may have been two teams about to play on the field (the Germans were here too), there were at least three sets of supporters in the stadium. And each had its own conflicting and overlapping desires. Later, one set went home delirious. I’m still not entirely convinced the other two noticed. Aside from the spectacle of the game, the crowd had an ebb and flow of its own. I was seated high in the corner of the stadium, technically just to the right of the official Argentina section, though its fans were sprawled all around me. They were in magnificent voice, as the conditions they now found themselves in forced them into their full repertoire. Any attempt to start up the “Brasil, Decime Qué Se Siente” chant that had drowned out the PA in previous games was met with an answering volley of sustained boos from the Brazilians in the crowd, some of whom spent as much time craning their necks toward possible provocations to be addressed in the stands as watching the game. It caused an aural dissonance at times, as the two South American neighbors bickered through the medium of mass singing, regardless of events on the field. Further discussions were conducted via wagging fingers. An Argentine, wrapped in a flag and wearing a jester’s hat, would rise to his feet and taunt a bespectacled, middle-aged Brazilian fan with seven raised fingers. The Brazilian would hold five fingers aloft, for five championships, point at his tormentor and raise a further two for theirs, then both parties would agree they had more in common than what separated them, settling for a respectable single raised middle digit each. When Gonzalo Higuaín’s offside goal went in, the mixed signals were especially pronounced. First the Argentines leapt to their feet in celebration, then a few seconds later the Brazilians noticed the flag and leapt to their feet, motioning for the Argentina fans to sit down. As this unfolded, the four German fans (did I mention Germany was playing?) beside me stayed fixed to their seats, wincing. When those German fans did venture to chant, it was with the self-consciousness of someone’s date at a wedding who’s suddenly been asked to deliver a toast to those no longer with us. Lionel Messi missed. The tactics cam lurched overhead on its tether. The livid orange scar of photographers lining the field twitched. The video screens showed the sun setting behind Christ the Redeemer. 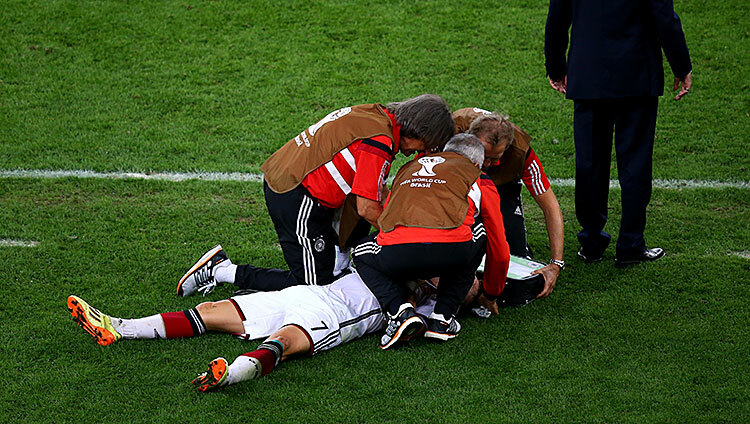 Bastian Schweinsteiger got steigered, then stitched. Germany scored. The Brazilians and Germans around me went wild. The Argentina fans stopped jumping. The final whistle went. Messi went up to get his Golden Ball award and was applauded politely all around. Danger averted, Brazilian fans made a point of seeking out Argentine fans they’d been shouting at all game and made genuine if exaggerated pantomimes of empathy, or less genuine miming of tears. At the far end of the stadium German fans celebrated, I think. The corporate hospitality guests near us, conspicuous by their laminates, lanyards, and discreet flags on cheeks, got up to “follow Marco back to the meeting point.” They would avoid eye contact with the lone angry Argentine fan yelling desperately back at a tormentor in Flamengo colors about what he’d do if these stewards weren’t here. A Brazilian fan in a wheelchair tapped a slumped Argentina fan on the shoulder, then posed for a selfie with him, holding the Argentina fan’s badge up in pride. Germany went up to get its trophy. There was a mass outbreak of booing. Dilma Rousseff, the unpopular Brazilian president, had appeared onscreen. 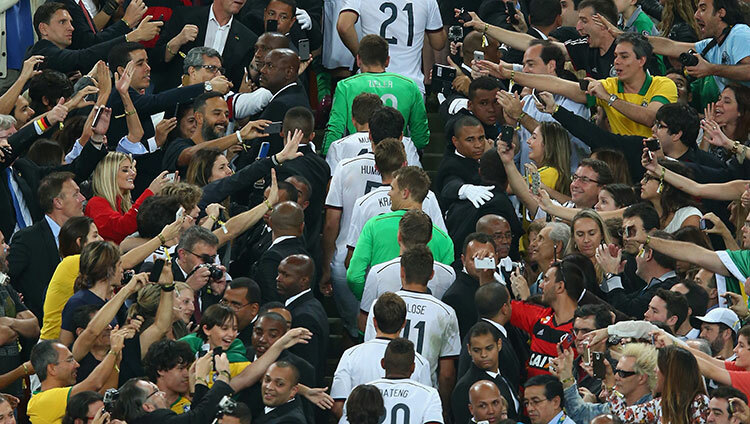 It emphasized a takeaway from this beautiful mess of a day: Germany is world champion. But it’s a local thing.